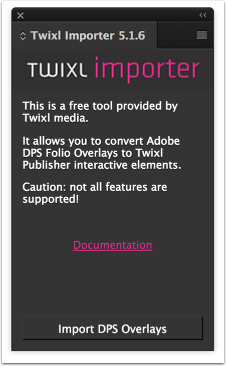 The Twixl Importer is a free plugin for Adobe InDesign that allows you to convert Adobe DPS Folio Overlay properties in a document to their Twixl Publisher counterparts. 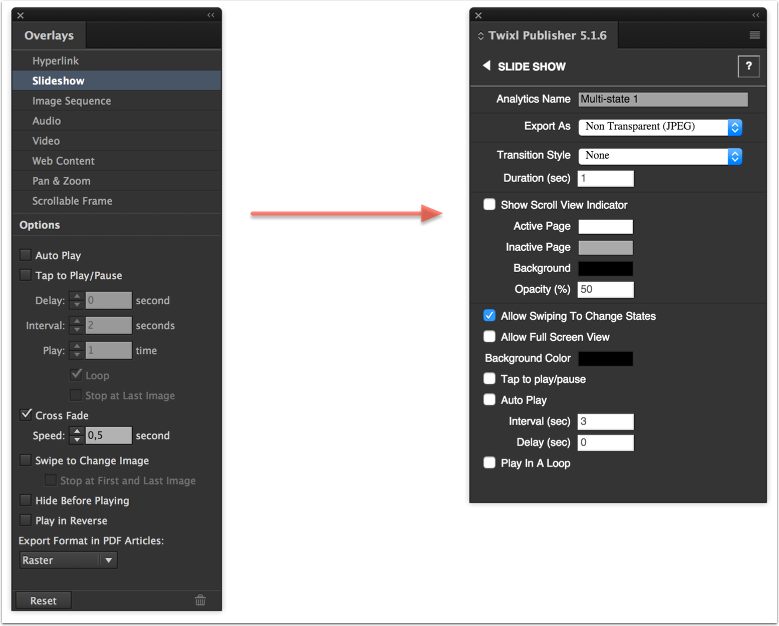 The Twixl Importer plugin works with Adobe InDesign CS6 and newer. It runs both on macOS (OS X) and Windows. The Twixl Importer plugin is installed automatically with the installation of the Twixl Publisher plug-in. In Adobe InDesign, you should find the extension under "Window" in the submenu "Extensions". Open the InDesign document containing the Adobe DPS Folio Overlays. Now open the Twixl Importer plugin from the Extensions menu under Window. In the main window of the plugin, click on the "Import DPS Overlays" button. The plugin will now go through all items in the document and convert all Folio overlays to their Twixl Publisher equivalents. It will leave the document in an unsaved state once finished so that you can revert if something went wrong. The original Folio overlays are retained and not altered in any way. Which interactive information will be converted ? Twixl Publisher does not support pinch & zoom in PDF exports of InDesign-based documents! For InDesign-based documents, we are convinced that our software has enough tools to create pixel-perfect designs (combined with some pinch & zooming when needed in Scrollable Content, Images and Slide Shows). After all, you want your readers to be able to read your content right away, without the need to pinch & zoom first! navto:// hyperlinks are natively supported and don't need to be converted. Certain types of nested interactivity that are not supported by Twixl Publisher will not be converted. In Twixl Publisher, HTML resources used for embedded content in web viewers are placed in a folder called ‘WebResources’. You can create this folder manually and place it at the same location of your InDesign book or document, but the plug-in will also create it automatically when you define a Web Viewer for the first time. Note that the contents should not be zipped, and should be placed there as is. The Twixl Importer plugin does not have an option to batch process the conversion of multiple documents. At the end of running this script, you will get a script alert saying "Import is done! ".